I’m a sucker for nicely wrapped gifts, but it can get expensive quickly by the time you pay extra for a gift bag or wrapping, tissue paper, ribbon, etc. each time you buy a present. Well, I’ve got some fun gift toppers for you that require little more than a plain white box and some odds and ends from your crafting supplies! 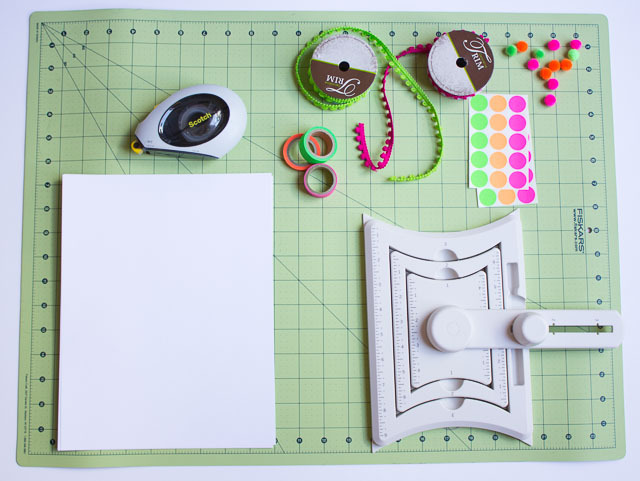 With this Martha Stewart gift box maker you don’t even have to buy the box! 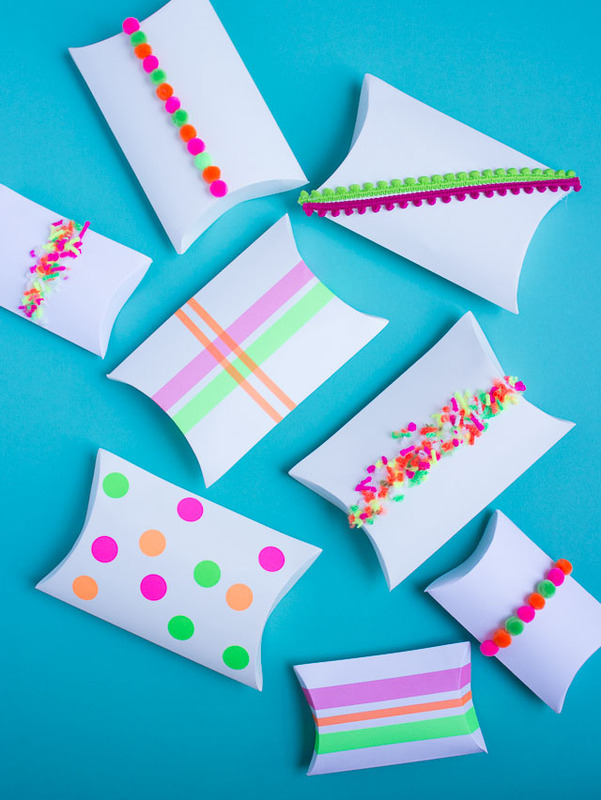 This tool makes pillow boxes perfect for small items and gift cards out of any pretty paper you have on hand. 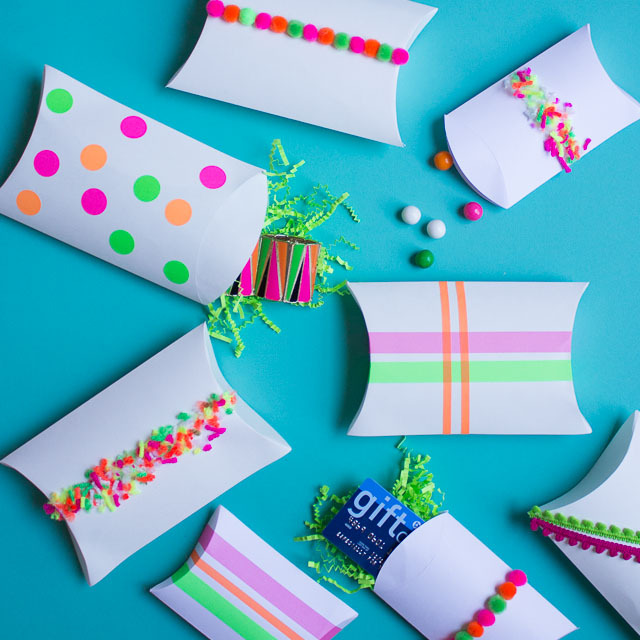 Here are 5 ways to transform a plain gift box in under 5 minutes! 1. Pom-Poms – I know I’d sure love getting a gift dotted with little pom-poms! 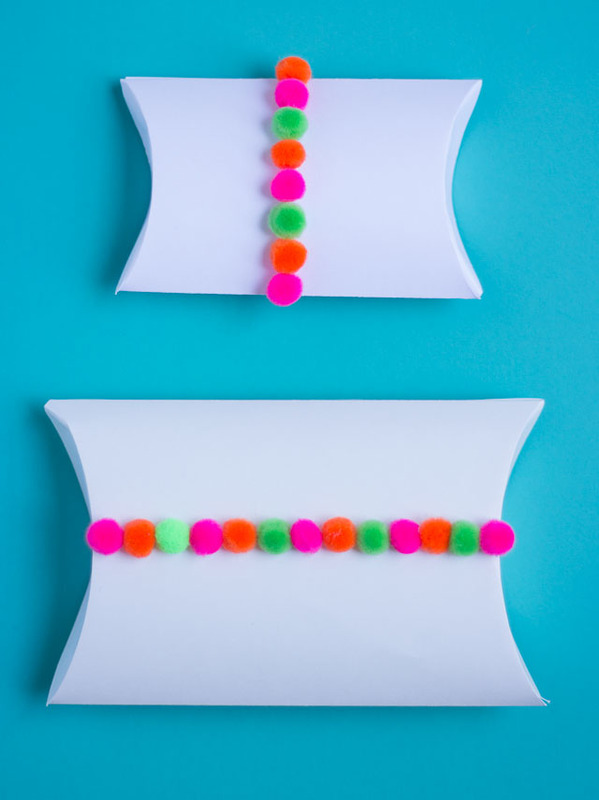 Just add a dab of hot glue and attach them in a line or scattered across the top of the box. These would be so fun paired with one of my pom-pom balloons! 2. 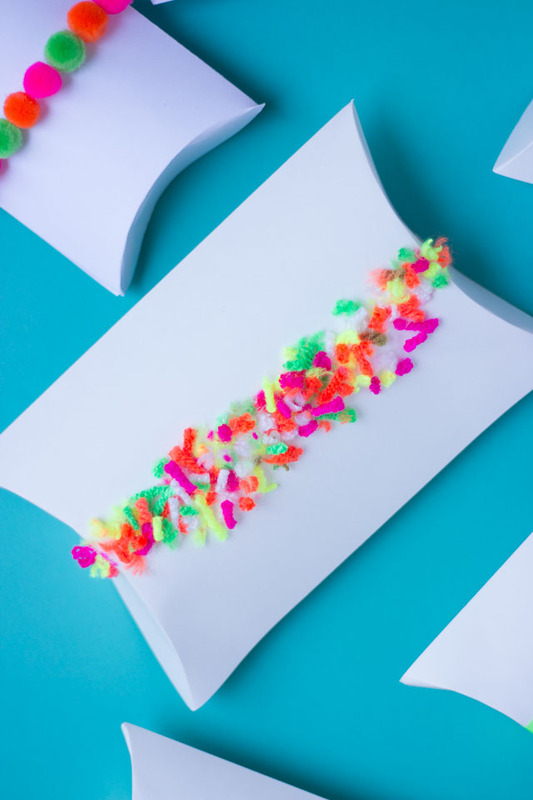 Yarn “confetti” – the next time you make some yarn pom-poms don’t throw away all those little bits you trim off – they make fun “confetti” for different art projects! To decorate the gift boxes, run a strip of double-sided tape down the middle, press a handful of yarn on top, and shake off the excess. You can add a dab of glue and more yarn to fill in any holes. 3. Office supply stickers – I always have a set of these neon colored labels on hand. Just peel and stick and you have yourself a present. 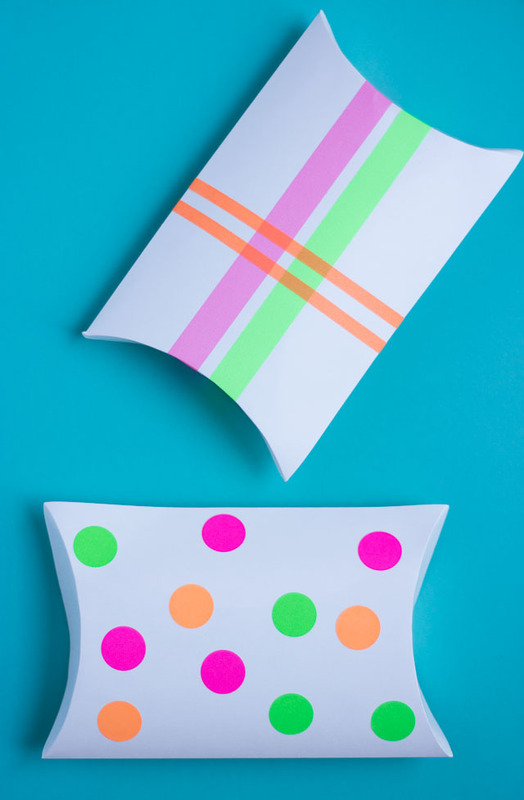 Pair it with these neon polka dot balloons! 4. Washi tape – so easy and so chic! Mix and match colors and patterns and try overlapping pieces for a fun effect. I’ve got the perfect balloon to pair with these too! 5. Ribbon scraps – ric-rac, pom-pom trim, whatever you have on hand. Add a couple strips to the top of the box with a dab of hot glue. Want to make your own gift boxes too? Read on to see how easy it is to do! 1. 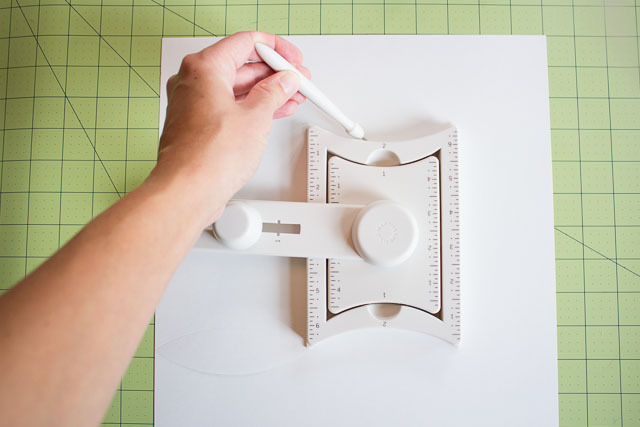 Select from one of 3 sizes of boxes to make and position the tool on your paper according to directions. 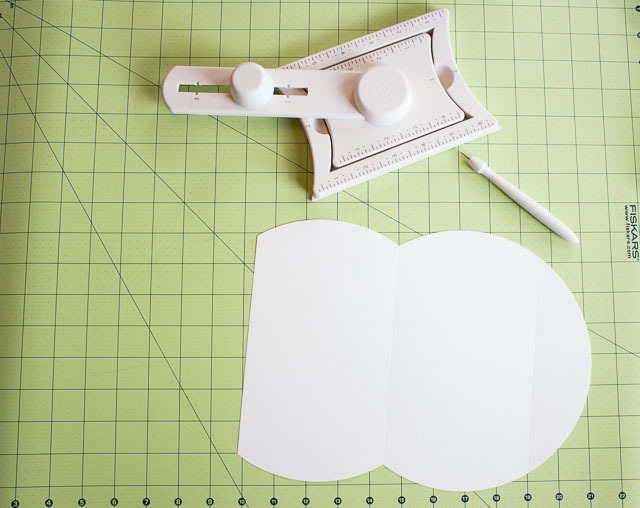 Use the scoring tool to score the edges of the box and the cutting arm to cut it out. The step-by-step instructions that come with the tool make this simple. Once you’ve made a couple boxes, this will be easy peasy to do over and over again! 2. The whole process takes just a few minutes. Once the box is cut out it will look like this. 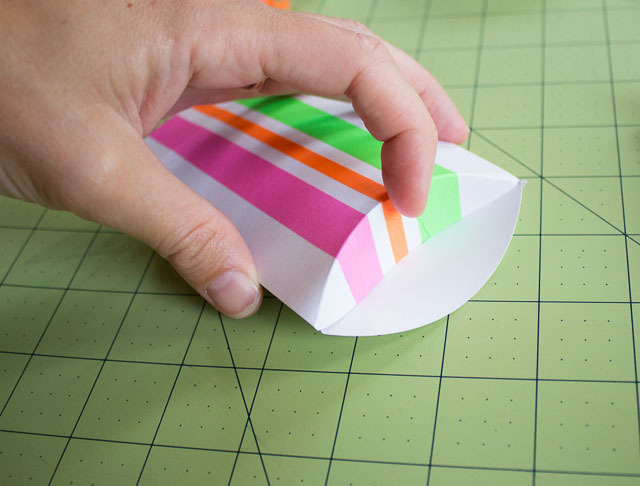 Fold along the scored edges to form the box shape and secure with double-sided tape! 3. You may find that some decorations like this washi tape are easier to put on before folding the box (while it is flat). You could make several of these boxes to have on hand and just keep them flat until you need a gift box in a pinch. 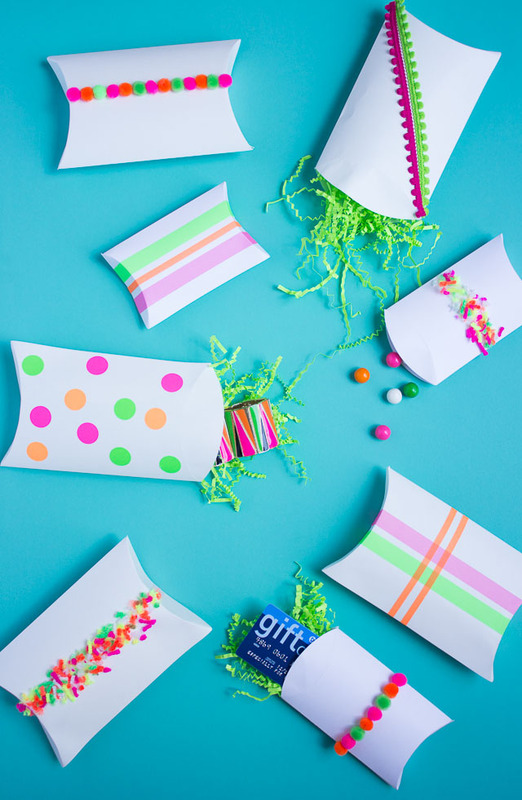 These boxes would make great party favors as well!